To the event place on Mt. 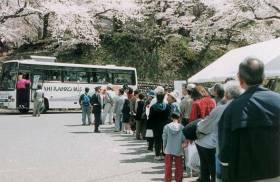 Maizuru, they operated a shuttle bus from the Tendo city hall, the station of Tendo, "Wakuwaku Land" at the Kuwanomachi area. It take over 20 minutes when you walk from a city hall to an event place of Mt.Maizuru. It seems to be very useful for aged persons and persons with weak legs because they were not necessary to climb up and down of such a mountain path. But everyone has a feeling to want to easy. So, you made a line to get on the bus like this picture. It was very fine this year and cherry blossoms were full, I saw that there were some family went down to avoid a crowded shuttle bus while enjoying a flower. There is a large open space of lawn at the event place of "Ninen Shogi" on the top of Mt.Maizuru. Usually it is taken habitually as an amusement place for family. 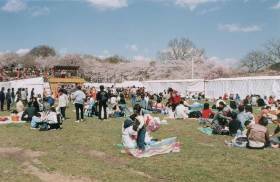 It is crowded with people seeing cherry blossoms if a cherry tree becomes full bloom. If you got tired of flower viewing, you can look at the "Ningen Shogi" and go shopping. I think that the people who visited here to see flowers were able to spend the very good weekend. Previous "Shops(2)" <Please choose...> Next "Attraction"